Use backpack mist blowers or similar devices to treat adult mosquito resting places. Identify and eliminate breeding locations. In instances where standing water cannot be removed, treat sites with appropriately labeled larvicidal products (most commonly insect growth regulators, or IGRs). 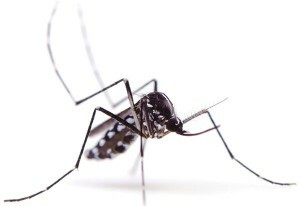 The most recently arrived mosquito-transmitted diseases in North America — dengue fever, chikungunya and Zika virus — are all transmitted from one infected person to the next via mosquitoes in the genus Aedes, specifically the Asian tiger mosquito (A. albopictus) and the yellow fever mosquito (A. aegypti). Both species actively bite during the daytime, and are well adapted for breeding in containers and other sources of stagnant water around human habitations. Because these mosquitoes can breed in a container the size of a bottle cap, no stone can be left unturned when it comes to looking for breeding sites. Homeowners have heard the message about children’s toys, flower pots and bird baths, but any place where water will remain for more than a week should be suspected. Easy-to-miss places include clogged roof gutters and drain pipes leading away from downspouts. These provide the perfect, hidden locations for mosquitoes to breed. Don’t forget decorative items in flower gardens and outdoor sports equipment; weighted bases on portable basketball nets in particular should be inspected closely. Additionally, check underneath decks — yard tools are sometimes stashed out of sight in these areas and may collect rainwater. Identifying breeding locations for Aedes mosquitoes should be approached head-on by technicians armed with the knowledge that these pests can breed just about anywhere. You can reach Dr. Jim Fredericks, VP of technical and regulatory affairs for the National Pest Management Association (NPMA), at jfredericks@pestworld.org.